The Sydney Gazette 17th March 1810. The first official St Patrick's Day ceremony held in New South Wales occurred on the 17th March 1810, at the Vaucluse home of Sir Henry Browne Hayes and was described by John Lang (1816-1864) in his book, " Botany bay: true tales of early Australia" The story was first published in 1852 as ‘Sir Henry Hayes’ and later became part of Lang’s collection of ‘botany bay: true tales of early australia’ published in 1890. John Lang was an associate of W.C.Wentworth whose historic resolution that "the Crown be petitioned to grant the colony a representative assembly" was.seconded by him at a meeting held at the Sydney College in 1842. And it was probably during his association with Wentworth ,that he heard from him, the story of how Sir Henry encircled his house on one St Patrick's Day with Irish peat,in a bid to stop any sun seeking snake from entering the house. The ‘Sir Henry Hayes’ legend appeared to many to border on myth, because of its religious connotation and generally disbelieved. In the story Sir Henry Browne Hayes, a wealthy Irish convict was troubled by the many snakes that entered his beautiful new house, the first Vaucluse House to sun themselves on the window ledge of his bedroom. And to stop them from entering, Sir Henry encircled the house with imported Irish peat, in the belief, that Irish soil once blessed by St Patrick, still possessed the power to deter the Vaucluse snakes from crawling over it. That story gave the house a charming Irish patina and was first published as ‘Sir Henry Hayes’ in 1853. The question raised was whether the story was true, whether Sir Henry an Irish convict had obtained the Governor’s permission to hold a St Patrick’s Day celebration at his home, with fellow Irish convicts. That question was left unanswered and too hard to prove, until now. 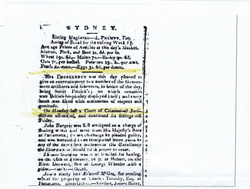 The discovery of the 17th March 1810 entry in the Sydney Gazette above, confirmed that John Lang’s story could be true if details of that St Patrick's day celebration held at Sir Henry's Vaucluse house,occurred before he gained his pardon and left the colony in 1812. .
On examination of the Gazette's announcement, ‘ His Excellency’ referred to Lachlan Macquarie who replaced the illegally ousted William Bligh as Governor of New South Wales, on the 1st January 1810. The “Government artificers and labourers” mentioned, were the selected Irish convicts allowed to honour their patron saint, St Patrick that 17th March,( the date of St Patrick's death) at the Vaucluse home of Sir Henry Browne Hayes also on the 17th March 1810. In the ‘Sir Henry Hayes’ story John Lang began with an eyewitness account of the celebration, probably by Mary Ann Piper, the wife of Major John Piper, a past owner of Vaucluse House. The narrator describes how Sir Henry, with the Governor’s permission (a lapsed Freemason William Bligh), had imported five hundred tons of Irish bog (peat) in forty barrel lots from Cork, and then conveyed by boat another six miles to Vaucluse, from Sydney. For Sir Henry a convict, to hold such a St Patrick's Day ceremony at his Vaucluse home together with 75 other Irish convicts, required the Governor's permission and one was given for an unspecified location for the 17th March, 1810 . It was very likely that Macquarie a highly placed Freemason like Sir Henry,permitted it to be held at Sir Henry's Vaucluse home. Linking the 'Sir Henry Hayes' story to the the 17th March, 1810 'Sydney Gazette' announcement,the 1810 year supports the story because Sir Henry who was twice jailed by Governor King, had a good relationship with his replacement, Governor William Bligh who probably allowed him to import the Irish peat, before his rebellious officers displaced him in the 1808 in the ‘Rum Rebellion’. The colony was then administered by the ‘rebel administration’ for two years during which time Sir Henry was twice jailed for gross disrespect of their ‘interim government’. On January 1, 1810 with the swearing in of the new Governor, Lachlan Macquarie, a practicing Freemason, Sir Henry had cause at last to celebrate. And what better time and place to celebrate the end of the ‘interim government’, together with his release from jail, then to celebrate it on the 17th March 1810, St Patrick's Day. And as stated in the Gazette's announcement, Governor Macquarie permitted the Irish to celebrate St Patrick's Day that year and one such party was held at the harbour side property of Sir Henry. The reference in the March 1810 Sydney Gazette, to "Government artificers and labourers'"most likely alluded to the 75 Irish convicts who in Lang's story arrived that 17th March, at Sir Henry's,Vaucluse home with shovels and wheelbarrows, to lay the 500 tons of Irish peat around the house. Those Irish convicts, like the ones described in the Gazette, could only have arrived at Vaucluse with the Governor's explicit permission to go there.The story nevertheless narrowed down the years, that the Vaucluse celebration could have been held, either in 1810, 1811 or 1812. The 1812 year was the least likely, because Sir Henry was pardoned on January 6, 1812 and departed for Ireland on December 4, the same year. This left 1810 or 1811 as the only two possible years that Sir Henry could have hosted the St Patrick's Day celebration at Vaucluse. And we definitely know from the story that Sir Henry had obtained the Governor's permission to host the celebration and we definitely know from the Sydney Gazette, that Governor Macquarie permitted the Irish convicts to celebrate St Patrick's Day on the 17th March of 1810 and not in 1811. So Lang's 'Sir Henry Hayes' story, must be the one reported in the Sydney Gazette. This of course makes the present Vaucluse House not only the site of the of the first St Patrick's Day ceremony held in Australia but also the first one encircled by Irish peat to ward off snakes. It is also Australian history. To date the Sir Henry 'snake story' has been ignored by the present Vaucluse House Trust as pure myth and not worthy of serious attention, because no Irish peat nor a bill of lading for its importation has ever been produced. But with the discovery of the 1810 Gazette announcement combined the 'Sir Henry Hayes" so called 'true story' ,it becomes obvious that the legend is based on fact.
. Recently several Freemasons pointed out that Lang's 'Sir Henry Hayes' story described many elements of the Freemason rite of circumambulation, which symbolises rebirth, resurrection and eternity, well known to Sir Henry who was a very committed Freemason. That can be left to Freemason historians to examine. Ironically it was Sir Henry who was involved in the first transport of Irish convicts to Australia. 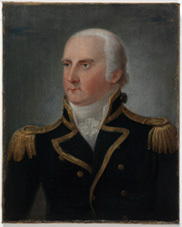 In 1791, Sir Henry Browne Hayes then as the sheriff of Cork and British Crown Agent, was ordered by his superiors to supervise the transport of a shipload of Irish convicts selected from 24 counties, on the 'Queen to the penal colony of New South Wales situated on the east coast of New Holland, as Australia was then called. The story is also about the first Irish convicts transported to Australia and Sir Henry's role in it in expediting it.It is a wow of a story and the importance of the Irish in Australian history, a story with many twists and turns. 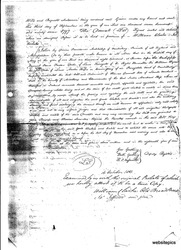 Our story begins in 1791 when Sir Henry Browne Hayes, the sheriff of Cork and the British Crown Agent, was ordered by his superiors to oversee the loading of the transport ship the 'Queen, with the first batch of Irish convicts, selected from 24 counties, to be sent the penal colony of Botany Bay in New South Wales. It was a long journey from Cork for the 133 male and 22 female prisoners including 4 children to make to Sydney, especially as they were cooped up in a small hold deep inside the 'Queen'. To make matters worse they were forced to eat very small portions of very poor food. It was also a terrible journey for the weak and sick with seven dying during the trip. Ten years later Sir Henry himself was transported as a convict to New South Wales, for committing a stupid crime because he was short of spending money. He kidnapped a wealthy Cork heiress at gun point, and forcefully 'married' her, just so that as her husband he could take charge of her inheritance. He failed miserably, and was forced to hide from the law for two years. On the run for two years as an outlaw he gave himself up, was tried in court and sentenced to death. On appeal against his death sentence, he had it commuted to life imprisonment ,to be served in New South Wales (then the arse end of the world). Sir Henry's adventure filled journey to New South Wales on the 'Atlas' ,must rank as pure black comedy and human tragedy. Outline of the sacred, great sky spirit ancestor, Baiami. He is shown wearing his sacred head dress and belt. The land between South Head and Botany Bay had been occupied by humans for the last 2000 years if not for the last 20 000 years. In 1788, there were seventy or so people of the Dharruk speaking Cadigal clan that lived a peaceful and untroubled life in the area bordered by the Pacific Ocean and the well sheltered harbour. There was plenty of fresh water to drink from the many springs and water holes and food from hunting the bird and animal life in the bush and excellent fishing all year long in the harbour. It was a wonderful place to live and rear a family. On the18 January 1788 the Cadigals witnessed what they thought were floating islands appear in the harbour and disgorge strange pale skinned humans. The First Fleet had arrived at Botany Bay and made contact with the first Cadigals. The floating islands only remained a few days at Botany Bay and packed up and sailed further north up the coast to enter Sydney Harbour seven days later on the 25th January 1788. On that day the ships anchored in the harbour and disgorged on land their human and animal cargo to the puzzlement of the watching Cadigals. Unseen they also disgorged pestilence and death. 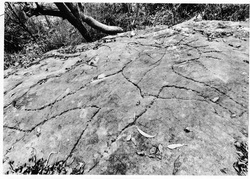 A year after contact with the new white arrivals all but three of the Cadigal clan were dead from smallpox, leaving behind only their rock carvings as a testament of their prior existence. One large incised sandstone rock at the rear of Vaucluse House remains of the cult hero Baiami. He has a human form and wears a head dress and waist belt. Baiami, recognisable by his headdress, was revered and worshiped by the Cadigals as their Great Spirit ancestor; it was he who had created all the land, all life and all the Cadigals. That incised rock remains well hidden and almost inaccessible today at Vaucluse with other carvings of animal and sea life. A sacred path had once existed past them, and which the Cadigal men used during their initiation and other secret, sacred and religious ceremonies. Then with the clan all but extinct, that whole area became terra nullius and was given away as land grants or sold to new boat arrivals such as Sir Henry, and it was here that he built his first Vaucluse House so close to the sacred walk way. In 1803 Sydney was a dull, dreary place to live in, where you starved if you didn't work. The Laycock and Cardell farms had once belonged to a Captain Thomas Dennett, a sea captain who in 1797 was the master of the transport ship the ‘Britannia’. The captain had the doubtful honour of having sailed one of the worst journeys in the history of transportation. The unfortunate convicts on the 'Britannia' were brutally mistreated, 10 men and one woman dying out of a complement of 144. The reason for their deaths according to Captain Dennett was that some convicts had conspired to capture the ship and failed. The conspirators were shackled in irons and unmercifully and flogged. Captain Dennett was equally brutal to women he deemed troublesome; they received sometimes up to four dozen cuts with a cane, often for the most trivial of offences. Elizabeth Rafferty who came to his notice was both young and pretty and when sentenced in Dublin to seven years transportation to New South Wales for theft. , Captain Dennett noticed her when she was brought on board and he decided make her his mistress for the duration of the journey. Elizabeth was fortunate to have been chosen by him to warm his bed because it saved her from his cruel and degrading treatment that he reserved for the convicts. The liaison between the two lasted for years and the grateful Captain left her the ‘Vaucluse Estate’ in his will. Dennett undoubtedly loved Mary Rafferty and left her the two properties as a token of his deep feelings for her. He neglected however to leave her the title deeds for the properties. So when Sir Henry purchased those two properties at auction for £100, instructed his agent in London to pay the £93 which was the balance of the sale after deductions of £7 commission. Unfortunately for Elizabeth, she never saw any money because the transaction was never completed; Sir Henry never received the title deeds for the properties and he never paid for them. The worst part about it was that no one seemed to care, least of all Sir Henry. In the meantime, the paper work for the sale had been completed and according to the Law and the auctioneer Simeon Lord gave Sir Henry permission to formally occupy the land on the 22nd August 1803. All in all Sir Henry had only spent £7 for ‘Vaucluse’ which was probably the reason why he leased the property to his friend and Valet Samuel Breakwell for 99 years at a yearly peppercorn rent. He had also named his estate ‘Vaucluse’ and built a Masonic inspired H shaped sandstone house on it. The curious thing was that the house was not built on ‘his’ land, but on Crown land. It was an error caused by poor surveying; that occurred because either the marker pegs had been moved or they just couldn’t be found when the house foundations were laid. 22nd day of August, 1803. Signed in the presence of Licensed Auctioneer. _Sir Henry had also found cause to challenge the penal administration, when Governor King forbade him the right to start up a Freemason lodge. Governor King then discovered what an unpredictable troublemaker Sir Henry was,,an articulate letter writer who informed the Lord Lieutenant of Ireland and the Lord Chancellor of Ireland about the scandals that wracked the dysfunctional New South Wales colony and exposed him to ridicule. The above engraving of 'Vaucluse Bay' shows two buildings, Vaucluse house on the left and an ancillary buildings on the right. That first Vaucluse House is shown with a pyramid capped turret built on either side. The two turrets symbolised the twin pillars of Freemasonry, Jachin (for "God will establish") and Boaz (for "in strength") and would indicate to a Freemason entering or leaving Sydney Harbour that there was a Freemason presence in the colony A Freemason is defined in 'The Oxford Dictionary of Architecture' as " a member of a secret or tacit Brotherhood organized into groups (Lodges) with a system of morality illustrated by symbols, allegories, and rituals, that probably originated in the late 16th century in Scotland." Sir Henry was a wealthy Irish convict who was sentenced to life imprisonment in New South Wales, for having abducted and forcibly married a wealthy Cork heiress for her inheritance. The grossly insulted lady however rejected Sir Henry's illegal, cave man approach to marriage and he was forced to flee. He was consequently declared an outlaw and was hunted for the next two years, with a large reward promised for his capture. At the end of two years he handed himself in for a trial. He was tried in court, found guilty and sentenced to hang but his sentence was commuted to life imprisonment when both the Lord Lieutenant of Ireland and the Chancellor of Ireland, colluded and overturned the judge's death sentence. Both these officials like Sir Henry were Freemasons and were bound to help each other. Transported to New South Wales, Sir Henry soon settled down to his new life, found other Freemasons in the military, some in the navy, the administration or simply settlers. Within a year he befriended enough Freemasons to form Sydney's first Lodge and as the colony’s most senior Freemason, he sought Governor King's permission to form it. 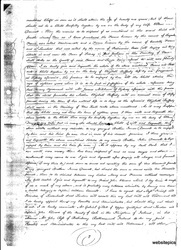 The Governor rejected his application outright which was reported in the Sydney Gazette, on the 22nd May 1803. And Governor King furthermore threatened to imprison Sir Henry, either at Castle Hill or worse still at Norfolk Island, if he dared to hold that meeting. To Governor King, the very idea of Freemasonry flourishing in the prison colony, with its members adhering to a code of secrecy, honour and loyalty to each other was completely unacceptable. He was experiencing at the time some serious problems with his ‘Rum Corps’ officers, many whom he suspected were Freemasons and actively undermining his authority. Sir Henry ignored the Governor's official refusal and still held a meeting on Saturday, May the 14th 1803 at Sergeant Whittle’s house. The meeting was consequently raided by a party of armed soldiers led by Surgeon Thomas Jamison, Sir Henry’s archenemy. Pandemonium ensued as the soldiers attempted to make arrests; the naval Freemasons from the two warships anchored in the harbour, drew their swords and rushed towards the door to make their escape; Surgeon Jamison avoided the bloodshed when he signaled his soldiers to allow them to get away. The Freemasons who remained were arrested and charged. At the subsequent court hearing, all those arrested were acquitted, except for Sir Henry who alone was sentenced to a term of hard labour in the “New Settlement” of Van Diemen’s Land, a sentence which was later commuted. Sir Henry also found it distressing that he had to live in Sydney, under the watchful eyes of his jailers and so he purchased at auction, on the 22nd August 1803, one hundred and five acres of beautiful bushland fronting the harbour, some seven glorious miles away from Sydney. The land belonged to an emancipist, a convict who had served her full sentence. He quickly had a house built there with a cattle shed close by, from rough hewn blocks of local sandstone. And because he imagined the land resembled the poet Petrarch's 'get away' at Vaucluse in Southern France, he too named his newly acquired property, Vaucluse. Still furious with the Governor who punished and demeaned him for hosting the Freemason meeting, Sir Henry planned to hold another one. He was determined not to let the Governor win or the threat of jail deter him. It irritated him to think, that such a social nobody as the Governor, such an ignorant upstart, such a nonentity, could wield so much power, and dictate everything Sir Henry could and could not do and worse still forbid him from holding a Freemason meeting, at a private house. He would triumph in the end and bring the colony's Freemasons together. And so Sir Henry devised his ploy, to circumvent that order. He chose to ceremoniously lay some Irish peat around the house on the 17th March, as a semi religious ceremony based on the date of St Patrick's death in 460 AD and because St Patrick's was reputed to have banished every snake from Ireland, he hoped that by involving the saint that it would help him too. Sir Henry also drew on his experience which he hoped would help him. In the Irish city of Cork, Atwell Hayes, Sir Henry's wealthy Freemason father had in 1784 named his recently completed dream home 'Vernon Mount' in honour of General George Washington who had inherited his American 'Mount Vernon' estate from his brother. Atwell Hayes in a spirit of defiant, dissent also named his 160 acre estate and villa 'Vernon Mount'. Washington besides commanding the Continental Army fighting the British in the American Revolutionary War (1775–1783), was also, a worshipful Freemason Master and a role model for most Freemasons. In New South Wales, 1804 proved to be a bad year not only for Sir Henry but also for Freemasonry, and the colony. The ominous specter of an Irish convict revolt was ready to explode. Many of the colony's convicts had been captured on 'Vinegar Hill' at Enniscorthy in Ireland during the 1798 rebellion against Britain. Now they were provoked again by the same people but this time in New South Wales, so very far from Ireland. The Reverend Samuel Marsden at Castle Hill, a bitter enemy of the Catholic Church, fearing the revolt became convinced that pikes were secretly being made and hidden in preparation for the uprising and so was on the lookout for them. It came he thought, when the soldiers brought in young Paddy Galvin an Irish convict for questioning but he knew nothing about the pikes. The Reverend Marsden thought he did, and convinced that Paddy could be made to talk, he ordered him to be flogged with the cat o'nine tails. But Paddy, who knew not a thing about the pikes, said nothing and was almost flogged to death. When the news of Paddy's savage beating reached the convicts, their pent up anger turned to rebellion. The insurrection began at 8 pm on Sunday March 4th 1804 with the tolling of the barracks bell at Castle Hill, the signal the convicts waited for; they attacked and overpowered their military guards and seized their weapons. As soon as the rebellion began, Governor King who was prepared for such an emergency called in the troops. Major George Johnston commanded them and very quickly quelled the revolt with a considerable loss of convict life. The site where that occurred was later named 'Vinegar Hill' after the one at Enniscorthy. Not one soldier was hurt during that convict rout. The revolt reflected badly on Governor King's record and he did his best to divert attention away from himself. 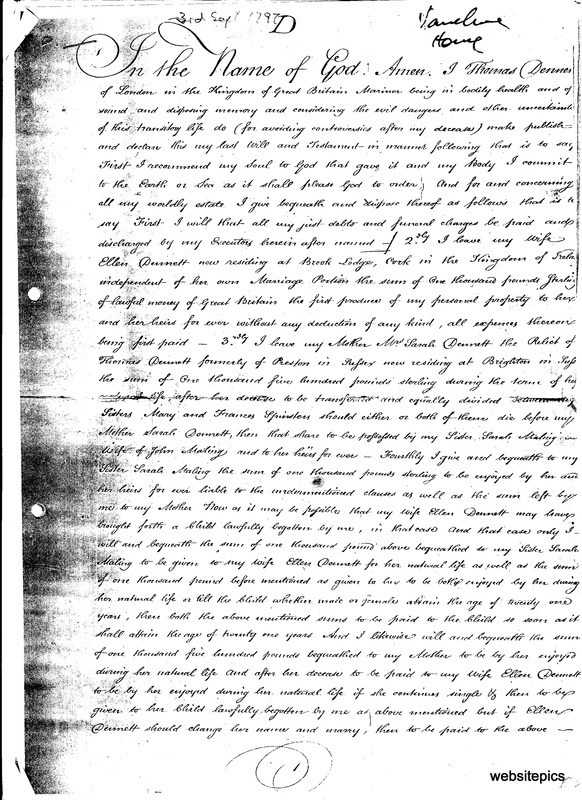 In a letter to the Colonial Office dated August 1805, Governor King defended himself by shifting the blame on to “characters who are well known who would, lose no means of stirring those deluded up to any act of atrocity. Among others are Maurice Margarot and Henry Browne Hayes.....” And he further singled out Sir Henry, stating that “This person has been a principal in every infamous attack that he and his colleagues have made on the reputation of those who cannot sufficiently despise their wickedness, nor is there any doubt of his having been much concerned in the insurrection of the United Irish at this place in March 1804." And then by removing Sir Henry and other vocal “trouble makers” to Norfolk Island, the Governor believed that he would have the time to restore some calm in the colony. Another eloquent convict whom the Governor exiled to Norfolk Island was William Maum, one of the ‘Scottish Martyrs’ and an acquaintance of Sir Henry’s. Maum was convinced that he and Sir Henry had been unfairly victimized wrote to Viscount Castlereagh on May 26, 1806[i] accusing Governor King of attempting to silence his critics with the threat of exile and thus divert attention away from himself. But Norfolk exile for Sir Henry lasted only one month and proved to be less severe for him than for Maum. During that time Governor King had reconsidered his decision to expose the island’s convicts to Sir Henry and Maurice Margarot’s rebellious influence had them relocated to the new prison outpost of Port Dalrymple in Van Diemen’s Land. He justified his sudden change of mind as ”that it was not his intention to ‘encumber the island with …such pests in one Settlement” and instructed that once there, they ‘should be made to work and not be maintained at the Government’s Expense.” But the ship carrying the two men sailed only as far as Port Jackson before a storm forced it to seek shelter there where they remained. Sent back to Vaucluse by the Governor, Sir Henry was ordered to remain there. Sir Henry now more determined than before, renewed his efforts to host a Freemason meeting. The challenge for him still remained as how to hold a Freemason meeting and not be jailed for defying the Governor. It could only be achieved by disguising its Freemason intent and so he centered it on St Patrick and his purging of the snakes, this time the area around Vaucluse House. This was not the first time that Sir Henry had disguised his true intentions[iii]. He had also successfully disguised the meaning of the artwork displayed inside 'Vernon Mount' in Cork. His father Atwell had leased it to him after the death of his wife in Cork in 1785. Atwell Hayes had abandoned his move into his recently completed 'Vernon Mount' estate unable to face living there without his wife so he leased it to Sir Henry, his son and heir, who moved in with his family the same year. 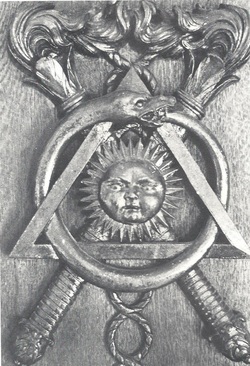 Once inside, Sir Henry commissioned Nathaniel Grogan, the very gifted Cork artist and probably a Freemason, to decorate the doors and ceiling in a similar style to Sir Francis Dashwood's neoclassical paintings inside his Hellfire club known, as 'The Order of the Friars of St Francis of Wycombe'. When Grogan completed 'Vernon Mount's' decorations, they appeared to resemble the Romantic neo classical paintings seen in most of the great houses in Ireland; painted scenes of pagan gods entwined with decorative, leafy finials of flowers and urns and a large Christian agape, painted on the ceiling, to affirm the owner's great love for God as in the 'Last Supper'. To a Freemason however Nathaniel Grogan's ceiling agape in 'Vernon Mount' told a different story. It focused on the Roman Virgin Goddess of War' Minerva who appeared to be disarming, laying aside her war spear and shield covered in Medusa's hide and clearly showing her face. Two winged putti (cherubs) help to disarm her; one taking her war spear whilst the second appears to help her with her robes. Minerva holds out a green sprig of acacia (associated with the third Freemason degree) whilst four child-like muses and the winged horse Pegasus make up the rest of the symbolic Freemason painting. The agape is bordered by an octagonal frame, Furthermore around the central agape, Grogan painted the Archangels Michael and Rafael with probably the Roman Goddess Fortuna holding a horn filled with a sheaf of grain and a steering paddle in the other . It may have been the Masonic Sheaf of Corn used in Masonic ritual; a mixed blending of the Judeo Christian and Roman religions. To the uninitiated observer it conveyed a charming, romantic, neoclassical statement of good taste and culture. But to the initiated it celebrated the end of hostilities between Britain and America, indicated by Minerva's green acacia twig (with fifteen leaves) in her right hand signifying the cessation of hostilities. It was the dove sent up by Noah from the ark following the flood that returned with that green sprig that indicated that the flood and universal destruction was over. Many other symbols are present such as the muse Urania, in the guise of the young boy probably Sir Henry's illegitimate son Atwell (muses are all female) holding out an open pair of dividers to Minerva while his other hand rests on the globe, signifying the universal reach of Freemasonry. Other Masonic colour symbols are employed such as the blue of Minerva's stole. The zodiac and the rainbow also contribute to the painting's statement and emphasize Sir Henry's deep understanding and commitment to his Freemason lifestyle. By naming the house 'Vernon Mount' Sir Henry and his father's demonstrated the great respect they had for General, George Washington and his cause because 'Vernon Mount' is the reverse of 'Mount Vernon'. They may have done this to disguise their support for the Freemason Washington. the narrator in the 'Sir Henry Hayes' story is the wife of a Major who had befriended him and now they were guests at his peat laying ceremony. The narrator then describes in detail how Sir Henry with the Governor's permission had imported five hundred tons of Irish bog (peat) from Cork as ship's ballast, in several forty barrel lots and then conveyed them six miles by boat, from Sydney to Vaucluse during the year; all these are Masonic numbers. To explain how he carried out the deception, first a few explanatory words about St Patrick, George Washington, Snakes and Freemason numbers. To most Freemasons, the 17th March, which is St Patrick's Day is significant because in America in 1780, General George Washington, a practicing Freemason, declared the 17th March, specifically a holiday to honour the Irish troops in his army for their courage and loyalty to America, during the 'American Revolutionary War' against Britain. Since then many Freemasons lodges in America have been named 'St Patrick'. 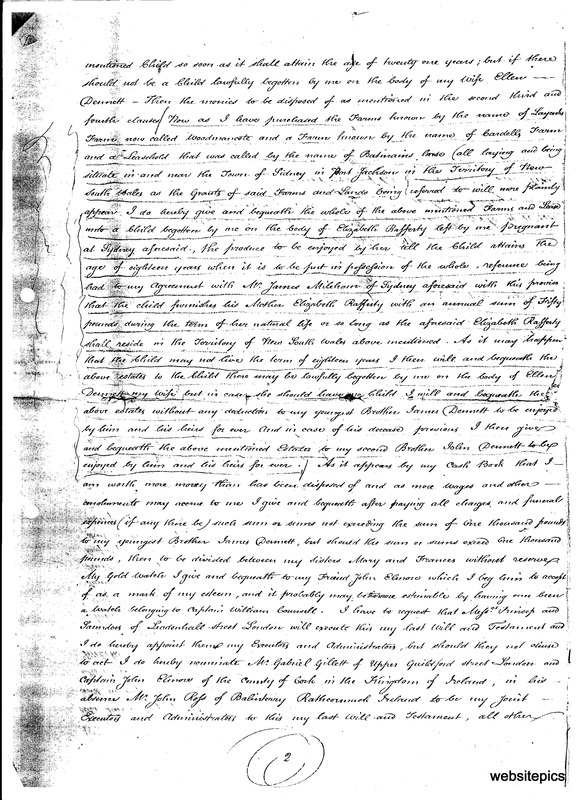 John Lang's 'Sir Henry Hayes' account, of how Sir Henry circumvented the Governor's directive should now be interpreted as a Freemason description of the ceremony. Six, forty, five hundred, fifty and seventy five are mentioned;six is a perfect number and is the sum of 1+2+3 ,and the product of 1x2x3. In ancient Greece the letter Phi, Φ denoted 500 which symbolized the 'grace of God' or lover of wisdom, intuition, perception and reform. The number 40 was the number of days and nights that it rained to cause the great flood described in the bible. It is also the product of 5 and 8, and points to the action of grace (5), leading to and ending in revival and renewal (8). Sir Henry according to Lang's story first marked out the area where the trench was to be dug around the house, six feet wide and two feet deep and with an inner radius of fifty yards and an outer of fifty six yards. To achieve that he required measuring instruments and tools, a two foot builder's square, a builders ruler and a rope to act as a compass to draw his concentric circles of fifty yard and fifty six yard radii around the house, which in this case was done with a fifty six yard rope for the first and then shortened to fifty yard of rope, all building instruments required to be present at aFreemason meeting.. Fifty is the product of 2 and 5x5 where two is the duad or female principle in Nature. It is also the first and only even prime number or the opposition of good and evil and light and darkness. The five represents the hypotenuse in a Pythagorean triad as well the five points of fellowship and the soul and body and in this case twice over. Fifty six or 2x2x2x7 represents the duad three times over and seven. The seven is referred to in many ways; Solomon took seven years to build the temple and dedicated it in the seventh month during a feast lasting seven days. With his preparations complete on the 17th March which was St Patrick's Day, the Superintendant of Convicts, an Emancipist, named Isaac Nicholls, arrived with seventy-five[i] Irish convicts, shovels and wheel barrows, to excavate the soil from the marked trench around the house and later fill it in with that five hundred tons of Irish peat. It was probably held on any of the following years, 1805, 1806 or 1807[ii] Building tools were present at the house, which was a Freemason requirement for any meeting. The radius of the circle around the house was mentioned as well as the depth of the trench that was to be dug; this necessitated the use of the compass and square, ruler, shovel and wheelbarrow. Sir Henry's given reason for the ceremony was to lay a circle of Irish peat around the house to prevent the snakes from entering it. The Freemason ceremony however symbolised the rite of circumambulation where all the snakes represented the symbolic self eating snake, in the form of a circle, the ouroboros which represented rebirth, resurrection and eternity. Furthermore since all the snakes shed their skin, that act symbolises rebirth. When Governor Macquarie a Freemason took office on the 1st January 1810 Sir Henry was given permission to hold his St Patrick Day's ceremony on the 17th March that same year and he invited the colony's Freemasons to Vaucluse to witness it. His reason for the ceremony appeared to be steeped in superstition to the colony's educated elite. Sir Henry seemed to suffer from the Irish disease of superstition which according to the Reverend Samuel Marsden was normal for them. 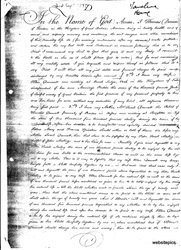 Marsden believed in his own bias and which he stressed in an 1802 letter sent to his superiors in London. He wrote that among the colonial Irish, "The number of Catholic Convicts is very great (Sir Henry was a Protestant) ... and these in general (are) composed of the lowest Class of the Irish nation; who are the most wild ignorant and savage Race that were ever favoured with the light of Civilization; men that have been familiar with ... every horrid Crime from their infancy. Their minds being destitute of every Principle of Religion & Morality render them capable of perpetrating the most nefarious Acts in cool Blood." It was this warped view which two years later drove the Irish convicts to rebel in the tragic 'Vinegar Hill' rebellion. That being so, still not one Freemason, true to his vows of silence, disclosed to the uninitiated, the true nature of Sir Henry's get-together and so the Governor was left bemused and ignorant of the 'ceremony's' true meaning. Hence no soldiers were sent to break up the party or arrest the invited guests. To explain how the deception was carried out, first a few explanatory words about St Patrick, George Washington, Snakes and Freemason numbers. To most Freemasons, the 17th March, which is St Patrick's Day is significant because in America in 1780, General George Washington, a practicing Freemason, declared the 17th March, specifically a holiday to honour the Irish troops in his army for their courage and loyalty to America, during the 'American Revolutionary War' against Britain. The 17th March also happened to be associated with St Patrick who brought Christianity to Ireland and cleared it of snakes. That date also became an important Freemason date. Since then many Freemasons lodges in America have been named 'St Patrick'. John Lang's 'Sir Henry Hayes' story can also be interpreted as a Freemason ceremony. The symbolism is there. The circle's centre, represented the individual 'brother' who surrounded by the circumference, understood that it correspond to his boundary of duty, to the Great Architect. And so when the dot or position was chosen for the circle's centre, it symbolize God, who just as the circle drawn around it had no beginning and no end, to a Freemason it represented both the Alpha and the Omega of all things. The centre in this case may have been the foundation stone, the corner stone or even the house itself. For the Irish convicts who dug out the trench and filled it with peat during the ceremony, the task was a deeply religious Catholic, experience and not one of labour. 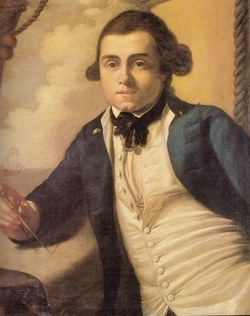 Midshipman Bligh, with Masonic amulet around his neck and open compass held in his right hand. Sir Henry had out- smartened Governor King and successfully re-established the fraternal bonds that bound the colony's Freemasons. Those bonds lasted but briefly, torn apart again when William Bligh succeeded Philip Gidley King as the Governor of New South Wales on the 13th August 1806. 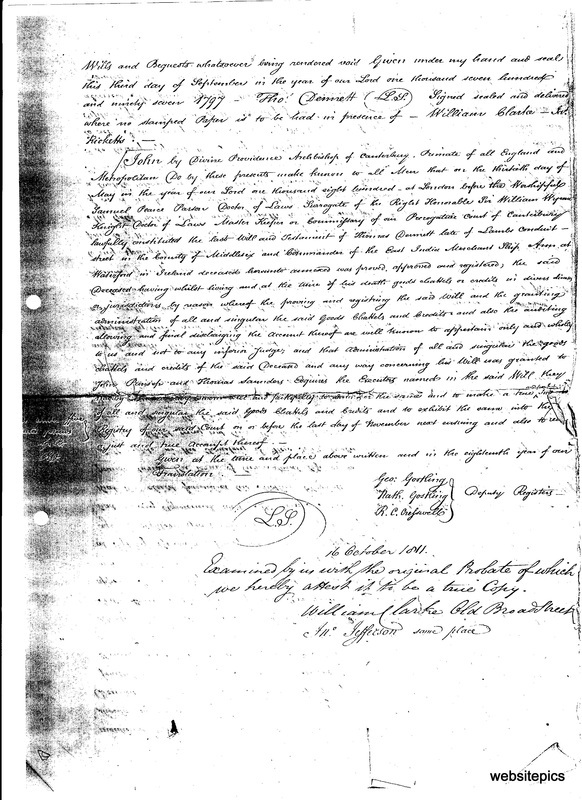 Bligh was born on September 9, 1754 and was promoted from an Able Seaman to a Master's Mate on the HMS Ranger, on September 30 1775, three weeks after his twenty-first birthday. The portrait may have been painted to celebrate his twenty-first birthday, becoming a Freemason and his promotion to Master's Mate and could therefore be referred to as 'Master's Mate, William Bligh". It was during Bligh's tenure in New South Wales as Governor, that the entrepreneurial interests of the many colonial Freemasons clashed violently with his perceived duties as the Governor of the penal colony. 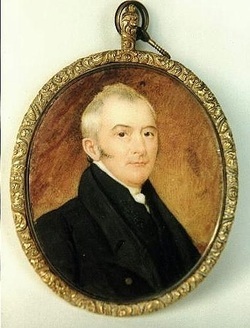 His two stormy years of duty ended when his Freemasons officers such as Captain Anthony Fenn-Kemp, and Sergeant Whittle, conspired with John Macarthur and other disaffected entrepreneurs , to illegally force him from office and in the process humiliate him, in the so called 'Rum Rebellion'. Sir Henry then took it upon himself to vociferously champion Governor Bligh with the result that he frequently clashed with many Freemason officers who helped to remove Bligh. He accused them of treason which if proven was punished by hanging, drawing and quartering and in an effort to silence him, they twice sentenced him to the Coal River jail with hard labour. This acrimonious division among the Freemasons lasted for two years until the new Governor and Freemason, Lachlan Macquarie was installed. And there are still many who disbelieve that Sir Henry's peat laying ceremony never occurred; that the Lang's story is pure fiction because no traces of Irish peat have been found around the house, nor a ship's bill of lading for any imported peat. However the 'legend' of Sir Henry's Irish peat encirclement of Vaucluse House has survived the last two hundred years and proven to have really happened. Sir Henry was pardoned in 1812 and left the colony for Ireland in the same year. Fifteen years later, in 1827; W.C.Wentworth purchased the Vaucluse property and rebuilt the house. Only a few sandstone blocks of the first Vaucluse House remain in the foundations of Wentworth's house. The legend of how and why the Irish peat was used to encircle the house lives on in John Lang's book and only now is its Freemason's symbolic content starting to be understood. An interesting note to finish on; in 1820, Anthony Fenn-Kemp (1773- 1868) the Freemason officer who played a leading part in removing Bligh from office and who afterwards clashed frequently with Sir Henry, was granted two parcels of land amounting to five hundred acres, some forty two kilometers west of Sydney. In the same year on the 12th August 1820, Australia's Social Lodge No260 1C met for the first time and in the same year Fenn Kemp named his new land grant, 'Mount Vernon' in honour of the charismatic George Washington, the American patriot and the Master Mason. He had fooled Cooper Penrose to invite him for dinner and so that he could meet Mary Pike. The ceremony may have been staged on the 17th March in any year between 1804 and the removal of Governor Bligh in 1808. All the Freemasons except Sir Henry were aligned against the Governor. Sergeant Whittle and Anthony Fenn-Kemp became Sir Henry's bitter enemies because of his outspoken loyalty to Bligh..
 Picture sent by Ricky Pound'.